You might wonder why you need to read the DNA from a single cell. Why not just collect more cells? Well, not all cells are created equal. In fact, the harder you look, the more individual differences you find. Take bacteria. There are many instances where researchers may only have one specimen of a bacterium in a complicated mix, and they need to figure out its identity. That’s now more important than ever, because many unknown bacteria from the gut and skin that influence health and disease, for example, can’t be cultivated in the lab. For these specimens, it would be invaluable to read the DNA from a single cell. Now we can, far more accurately than ever before. So how exactly did researchers make this fancy, highly accurate, DNA copier? 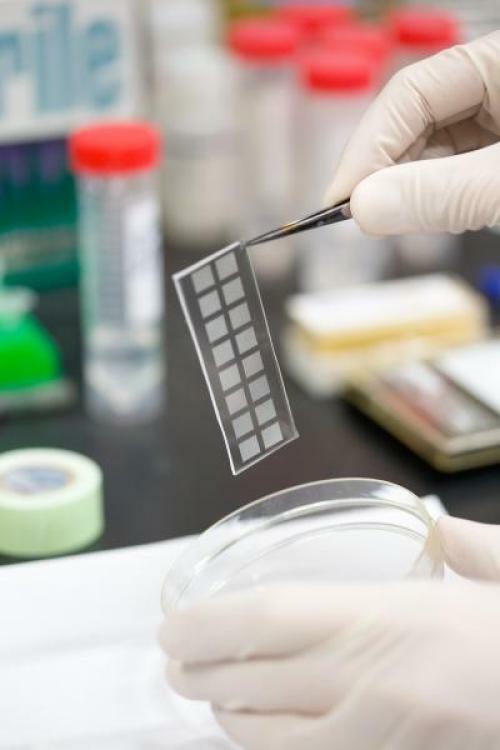 They worked with materials engineers to create a silicone slide with tiny compartments that are barely more than pinprick size indentations, or wells. Arrays of these tiny wells serve as microscopic test tubes. The new technique—Microwell Displacement Amplification System, nicknamed MIDAS—drops a single cell into one of these tiny wells, where a series of chemical reactions replicate the DNA. This replicated DNA is then read by sequencing machines. The team tested MIDAS on an individual bacterium and showed that it enabled them to read significantly more of the genome sequence than they could when using the single cell sequencing methods currently available. Furthermore, when they used MIDAS to examine the genomes of individual nerve cells from human brains, they detected significant differences between cells—even between neurons in an individual, healthy brain. This is consistent with a string of surprising findings that suggests that genomes in our body may vary from cell to cell, because of changes that occur as DNA is copied during cell division. That’s a surprise! The human body has trillions of cells and, with a few exceptions like cells that produce antibodies, scientists have believed that essentially all cells from an individual contain identical sets of DNA. But recent studies   suggest that somatic changes in the DNA—those changes not inherited from the parents—might arise in cells naturally and could, under the right circumstances, trigger disease. Now, researchers using MIDAS can search for even more subtle differences between the genomes of two cells from the same tissue or organ of an individual. These differences could provide insights into the evolution of neurodegenerative diseases, and also of cancers—which are known for being a genetically heterogeneous collection of cells. This new technique is certain to help us expand our library of genome texts. And this expanded, more accurate library will prove invaluable for teasing apart the genetic differences between healthy cells from the same individuals, between sick and healthy cells—for probing the roots of disease—and ultimately for developing treatments. Massively parallel polymerase cloning and genome sequencing of single cells using nanoliter microwells. Gole J, Gore A, Richards A, Chiu YJ, Fung HL, Bushman D, Chiang HI, Chun J, Lo YH, Zhang K. Nat Biotechnol. 2013 Nov 10. Mosaic copy number variation in human neurons. McConnell MJ, Lindberg MR, Brennand KJ, Piper JC, Voet T, Cowing-Zitron C, Shumilina S, Lasken RS, Vermeesch JR, Hall IM, Gage FH. Science. 2013 Nov 1;342(6158):632-7. Neuronal DNA content variation (DCV) with regional and individual differences in the human brain. Westra JW, Rivera RR, Bushman DM, Yung YC, Peterson SE, Barral S, Chun J. J Comp Neurol. 2010 Oct 1;518(19):3981-4000. Video of MIDAS at work. NIH support: National Human Genome Research Institute; National Institute of General Medical Sciences; National Institute of Mental Health; Office of the Director. Researchers include recipients of a Transformative Research Award and a New Innovator Award. Thanks for the information … I wish to learn more things about it! Does such cell-to-cell variation of the genome have implications for forensics — for example, the use of DNA analysis to prove a defendant is guilty or not guilty? Fantastic post. However, I was wondering if you could write more on this topic? I’d be very grateful if you would elaborate a little bit more. Many thanks!